An epic adaptation of Homer's Iliad, Troy is a wildly enjoyable romp through ancient Greek mythology. The mammoth scope of the Trojan War and the intriguing mix of characters involved in the siege, including kings, combatants, and their women, are brought to life with a lavish treatment enhanced by stunning cinematography and sweeping special effects. It's the 8th century BC, and after years of warfare, king Agamemnon (Brian Cox) has almost succeeded in unifying all the Greek kings and armies under his command. 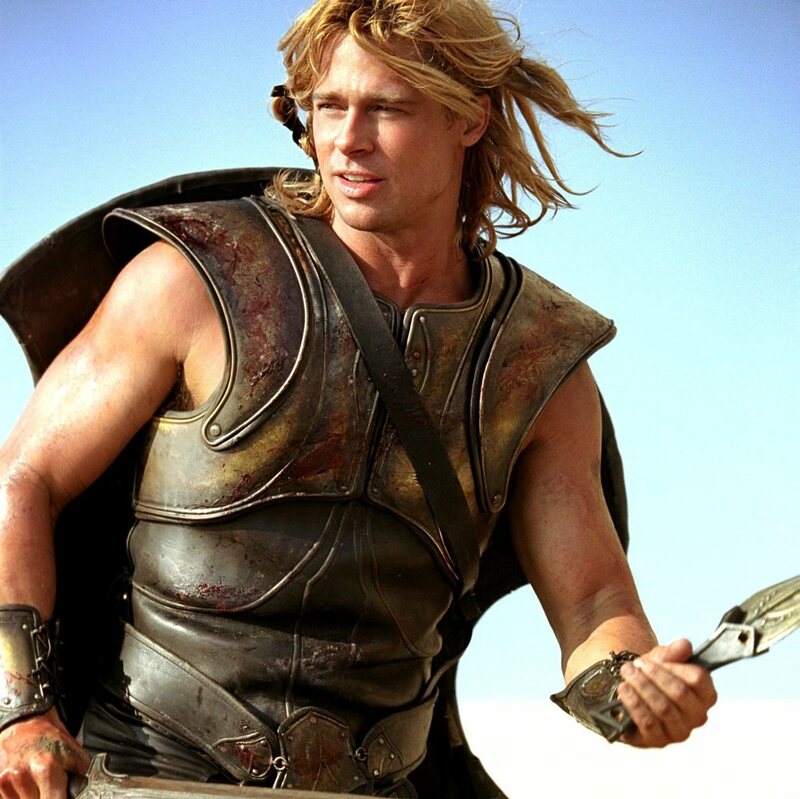 The demi-god Achilles (Brad Pitt), the most fearsome warrior in the land, holds no respect for Agamemnon but does help in battles, as his destiny is to engage in constant war. King Odysseus (Sean Bean) is loyal to Agamemnon and one of the few men that Achilles respects, and acts as intermediary between the two. Odysseus: Men are haunted by the vastness of eternity. And so we ask ourselves: will our actions echo across the centuries? Will strangers hear our names long after we are gone and wonder who we were, how bravely we fought, how fiercely we loved? While the coastal city of Troy remains independent behind its imposing defensive walls, Agamemnon's brother king Menelaus (Brendan Gleeson) negotiates a peace treaty with Troy's two princes, Hector (Eric Bana) and Paris (Orlando Bloom). 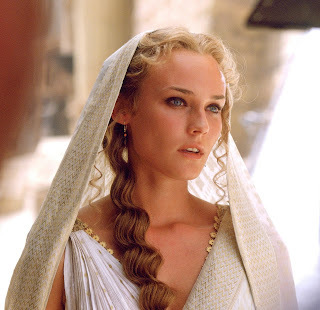 Hector is older and more mature, but the younger Paris is less experienced, more impetuous, and foolishly falls in love with Helen (Diane Kruger), Menelaus' wife. When Helen decides to join Paris on his return journey to Troy, Menelaus is personally outraged, but Agamemnon recognizes the opportunity to use the illicit love affair as an excuse to launch an all-out assault to subjugate Troy. Assembling a massive army of 1,000 ships and 50,000 soldiers, including Achilles and his young cousin Patroclus (Garrett Hedlund), Agamemnon wages a vicious war against a stubborn Troy and its king Priam (Peter O'Toole). 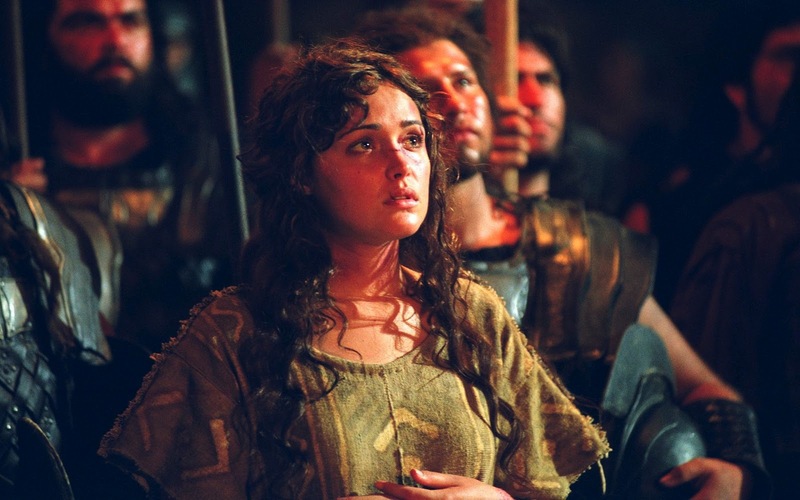 The campaign is full of bloody battles, unexpected triumphs, and setbacks for both sides, in the midst of which Achilles nurtures a romantic relationship with Hector's cousin the priestess Brisies (Rose Byrne), before the most famous ruse in warfare history is conceived by Odysseus to turn the tide of battle. Thetis, Achilles' mother, to her son: If you stay in Larissa, you will find peace. You will find a wonderful woman, and you will have sons and daughters, who will have children. And they'll all love you and remember your name. But when your children are dead, and their children after them, your name will be lost. If you go to Troy, glory will be yours. They will write stories about your victories for thousands of years and the world will honor your name. But if you go to Troy, you will never come back, for your glory walks hand-in-hand with your doom. And I shall never see you again. The Troy script by David Benioff is a modern-day masterpiece of cinematic literature. Deriving an elegant and relatively compact narrative out of Homer's sprawling story, and adopting a historical rather than mythological approach, Benioff successfully achieves the difficult task of introducing a large number of essential characters and events, and ensuring that they remain distinct and memorable. He also conjures up an impressive number of epic dialogue lines, which, while undoubtedly self-consciously pompous, help to capture the cross-millennial significance of ancient history's most intriguing war. Odysseus: This war will never be forgotten, nor will the heroes who fight in it. With a solid screenplay to work from, director Wolfgang Petersen can focus on breaking out of his typical love of confined spaces, and he simply soars into the wide expanse of mythology. Working with cinematographer Roger Pratt, Petersen fills Troy with a succession of stunning images, including the thousand Greek ships approaching Troy's shoreline, and directs the combat scenes with brilliantly choreographed zest. Petersen's fluid aerial cameras capture armies marching and then crashing into each other with dreadful force, the horrors of war elevated to meet the merciless standards of mythological legend. The computer-generated enhancements are seamlessly integrated, and Petersen keeps the humans at the centre of Troy, using the microchips to full advantage but never allowing them to seize control. Odysseus, to Achilles: War is young men dying and old men talking. You know this. Ignore the politics. It would have been easy for the actors to be swallowed up by the spectacle, but Brad Pitt delivers a surprisingly nuanced performance as Achilles, a man born for war but finding nothing worth fighting for. A killing machine, a keen observer of the world, and a magnetic lover, Pitt creates an Achilles worthy of his exalted place in legendary history. Eric Bana almost matches Pitt, sword swing for sword swing, Hector emerging as by far the most noble character in Troy, protective of his younger brother, defender of Troy, caring for his family, respectful of his father, and an expert combat warrior. Hector: All my life I've lived by a code and the code is simple: honour the gods, love your woman and defend your country. Troy is mother to us all. Fight for her! The good performances continue, with Peter O'Toole a distinguished Priam, Rose Byrne feisty as Brisies in the face of prolonged physical threat, Sean Bean thoughtfully effective as Odysseus in his relatively few minutes of screen time, and Vincent Regan memorable as Achilles' faithful lieutenant Eudoros. Julie Christie gets one scene, but delivers one of the best lines in the movie (quoted above), as Thetis, Achilles' mother. Slightly less convincing are a couple of the younger actors, both Orlando Bloom and Garrett Hedlund lacking the necessary presence to hold their own amidst the overwhelming grandeur. The James Horner music score is appropriately exalted, and employing a less-is-more philosophy, at times makes use of minimal sounds to brilliant effect, as in the drums that provide the backdrop for the battle between Achilles and Hector. Vocalist Tanja Carovska adds a few anguished passages to lament the mass slaughter of men in meat grinder battles, and to the credit of Horner and Petersen, the soundtrack is never repetitive despite the film's 162 minute running length. Troy is an ambitious and immersive experience, a magnificent cinematic achievement worthy of representing the monumental legends that inspired it. Odysseus: If they ever tell my story, let them say... I walked with giants. Men rise and fall like the winter wheat... but these names will never die. Let them say I lived in the time of Hector, tamer of horses. Let them say... I lived in the time of Achilles.